I am sorry not to have posted since Nov. 2011. I guess that is a good sign that Liz is still do GREAT! 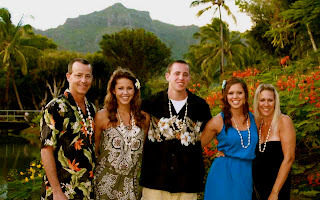 We took our long awaited trip to Hawaii at Christmas time, 2011. This was the trip we were supposed to take the year (2008) Liz was diagnosed with Leukemia and our "new reality" began. We had the time of our lives by celebrating Christ's birthday, Randy's parents 50th anniversary, and life! Maybe someday we will have the great blessing to return to Hawaii with our children and their spouses! Liz had a fantastic experience on the Mason Basketball team. The team won their GMC conference! 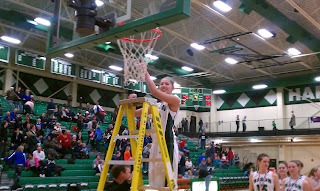 Here is a picture of Liz cutting down the net. 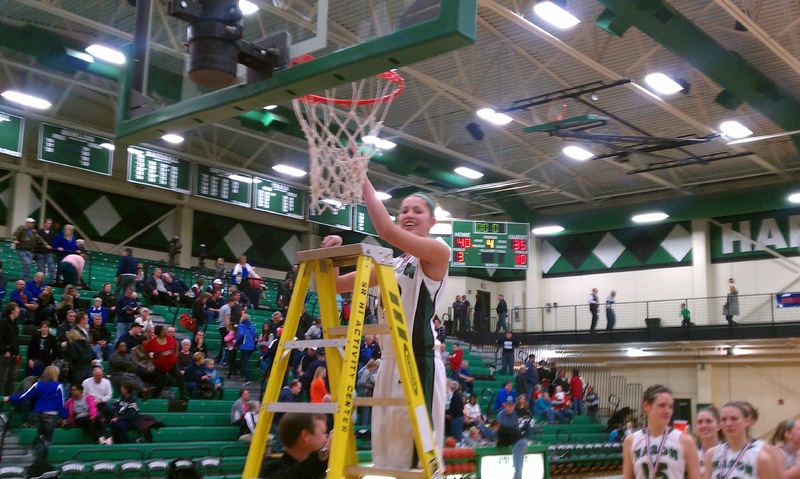 Kayla McDowell, her friend and teammate, had to tell her how and what to do with the net. She asked Kayla "Do you just drop the net (the part she cut) on the floor?" Kayla responded with a laugh and said "No, you tie it on to your medal." Liz took it all in stride and laughed at herself just like she always does. Feb. 17, we celebrated her one year post treatment, YEA!!!!!!!! I took her to Children's where they gave her seven different shots to re-immunize her, she is now up to date with her vaccines. We also said goodbye to our fist Oncology Dr. we met that fateful morning at 4:30 am. Dr. Jen has moved to Charlotte, NC with her family and will be working at a Children's hospital there. I know that that hospital will soon realize just how blessed and lucky they are. They are receiving one of Cincinnati Children's best doctors and we will truly miss her. Liz has her monthly check-ups that consists of blood work and a physical exam. In Feb., her one year post treatment, Liz also had an EKG and an ECHO. Her ECHO came back with a low reading. This means that there is a possibility that she could have some heart damage from the Doxorubicin Chemo that she received during certain stages of her treatment. Dr. Absalon said that ECHO's can give false reads. We will have a repeat ECHO in Aug. to see if it was a false read. If it is not, she will be going on heart medication for the rest of her life. Please pray, as we are, that the ECHO was just a false read and the repeat ECHO in Aug., comes back in the normal range. We no longer live our lives by the second. Sometimes it seems as though her diagnoses and treatment were years ago, but it only takes a second for that night to come rushing back with all of the horrific emotions and memories. Unfortunately two weeks ago, Becca Kniskern, was diagnosed for the second time with Leukemia. Becca, was diagnosed the same time as Liz in 2008 with ALL just like Lizzy. The form of treatment that they had to go through can cause other forms of cancer. Becca now has a form of AML (Leukemia). You can follow her journey through her blog at: beccakniskern.blogspot.com. Please join our family as we pray for her family, Trisha, Ethan, Lilly and Becca as she/they bravely fights this horrible battle again. Joel and Maya as they continue on their way to a healthy life with healthy bone marrow growing inside their bones. For Becca, that she wins this battle. For Liz, that she remains in remission from this horrible disease. For the patients, parents, and staff that are on A5. For all who have lost their battle with cancer. So wonderful to read the positive update. Your family is a true inspiration! Hello From Charlotte! Though somewhat settled, my new life here seems surreal. I was giving my infamous sunscreen talk to one of my new teenage patients this week and couldn't help but to think of Liz. You continue to have my wishes for a lifelong remission, free of side effects from all the nasty chemo you so gracefully endured. So glad that Liz is doing so well and that you all had a wonderful trip to Hawaii - you deserved it! Miss seeing you guys!